Host Ripples Review 2019: Is Host Ripples a Good Hosting? 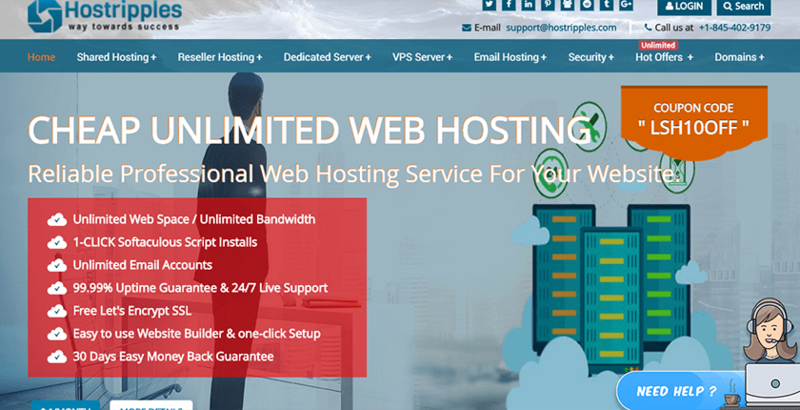 Hostripples has made a name for themselves in their short five-year existence by offering webmasters expanded options for their web hosting. Their standard features allow for any webmaster from rank beginner to seasoned pro the capability of creating the perfect website. Hostripples has been in business for over five years, and in that time, they now host sites for over 50,000 clients at over 15 data centers around the world. Also, to offer a wide selection of hosting options, their standard features list outperforms those of many high-priced web hosting services. With Hostripples, you have the option to choose from SSD cPanel hosting, Linux hosting, or Asp.net/Windows web hosting. All hosting is located on high-quality servers that include redundant and backup power supplies and a nearly 100% uptime guarantee. If you’re worried about website security and preventing DDoS attacks, Cloudflare protection is an excellent added benefit and one that few sites offer as part of their standard features. Support for CGI and Cron jobs is also somewhat rare. If you want to keep your data secure or want to sell products online, SSL certificates are a must, and Hostripples offers this for free. Hostripples couldn’t make it much simpler to get your site online. For beginners, you have access to a website builder and Softaculous web-app installer. Install WordPress and other CMS apps in just one-click. You have full cPanel access along with FTP uploads to build your site the way you want. Each hosting plan (SSD, Linux, and Windows) offers three service levels, all having many of the same features with the key differences noted below. Note that SSD hosting has limits on their data storage. I would prefer this to be unlimited like the other plans. I also would like that all plans got a free domain, even if you had to pay annually to get it. One advantage to picking with SSD hosting or Linux hosting is that you can choose your data center. For SSD hosting, you have a choice of data centers in the UK, India, or Poland. For Linux hosting, you can choose from 17 datacenters including the U.S., U.K., Canada, Germany, Italy, and the Netherlands. While there’s no free access available, they offer a 30-day unconditional money back guarantee on all plans. Hostripples has one of the more impressive support setups that I’ve seen. They have quite an extensive knowledge base as well as a downloads section where you can get manuals, programs, and other files to help build your site. You can reach support directly via email, phone, or through live chat. I was able to connect with customer support in about 30 seconds and was able to get a relatively fast answer to my question. I recommend you ask at least one question after joining to prevent any communication problems. onClick="trackClickout('event', 'clickout', 'Vendor Page - Visit User Reviews', 'Host Ripples', this, true);"
I have hosted my e-commerce site with host Ripples and so far I am pretty much impressed with their support team and service. If anyone of you is looking for good hosting at an affordable price I would personally recommend you to go for Host Ripples. Hostripples offers more options for web hosting than the majority of shared hosting providers. Their outstanding standard features make it easy to create any sized website and gives you the tools necessary to make it successful. Wondering how Host Ripples stacks up against other Web Hosting companies? Enter any other Web Hosting company and we will give you a side-by-side comparison.